Twenty-five years ago this year, in December 1983, Cornwall's Troika Pottery finally closed its doors. Falling orders and money problems had been dogging the pottery for some years before they finally succumbed - a sign perhaps of the changing popular tastes and economic recession of the early 1980s. The Troika story began twenty years earlier, in 1963. 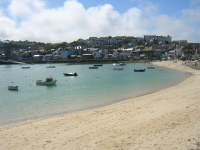 Benny Sirota and Leslie Illsley founded the Troika Pottery in St Ives, Cornwall. The young pair had a passionate desire to reshape the way people thought about studio pottery and were determined to create pottery for its aesthetic merit alone - without regard to potential function. This approach put them at odds with the established studio pottery movement of the time, epitomised by Bernard Leach. Studio pottery, it was said, should be functional and appealing. It should also be hand thrown - an approach that the Troika founders discarded almost from day one. The approach developed by Sirota and Illsley was to hand-throw a shape and then use it to create a mould. By doing this, dozens or even hundreds of examples of a given shape could quickly and efficiently be created. Each of these pieces was then painted and glazed by hand to create a unique finished product. This approach was particularly successful with Troika's rough-textured wares and enabled the pottery to achieve considerable production volumes without sacrificing the unique, hand-finished nature of each piece - key to its art pottery identity. This approach proved commercially successful, too, with the pottery winning large orders from fashionable London stores as well as developing a solid tourist trade in the West Country. 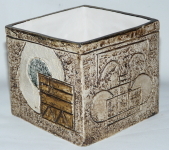 These textured pieces remain extremely popular with collectors today - with shapes ranging from the smaller marmalade, coffin and cube shapes through to the larger and more scarce double base, rectangular and large wheel vases. Rarer still are designs such as the mask, wall pocket and anvil vase - and there are many other shapes that are virtually never seen. 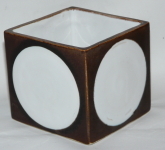 Troika's smooth-glazed wares - typically covered in a black, white or blue glaze and sparsely decorated - were originally made in smaller volumes than the textured pieces. Although artistically successful, they were less so commercially. More difficult to fire successfully, smooth-glazed wares suffered from higher levels of kiln damage and were eventually taken out of production. They are much scarcer today than textured pieces. So what's next for Troika? After a period in the collecting wilderness in the 80s and 90s, the collectable market for Troika has become very strongly established. We've been selling Troika for more than five years and in that time have seen a definite maturity come to the market - so here's to another 25 years of collecting Troika!